MARIN is an independent research institute for the maritime sector, specialised in Hydrodynamics and Nautics. We have a dual mission: to provide industry with innovative design solutions; and to carry out advanced research for the benefit of the maritime sector as a whole. Our customers include commercial ship builders, fleet owners, navies, naval architects and offshore companies the world over. As part of its mission, MARIN wants to help make shipping smarter, cleaner and safer. Wind propelled or asisted vessels have a good potential to make shipping cleaner. However, for wind propulsion/asistance to be succesful again requires knowledge on the constraints and best design practice of such ships. 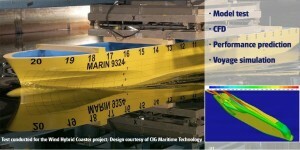 MARIN is actively working together with stakeholders and clients to build up knowledge and improve ship designs, specifcally with respect to hydrodynamic performance. This includes CFD calculations, development of Power Prediction Programme’s, voyage simulations, and powering-, and seakeeping model tests. Amongst others we collaborate in the the EU INTERREG funded “Wind Hybrid Coaster” and “SAIL” projects.